Words aren’t adequate to express my affection for today’s guest post writer. I adore Kari Long. She’s my person. I text her when I need someone to understand my sarcastic (sometimes mistakenly inappropriate) quips about social situations. You know when you are sure someone had too much plastic surgery and you really need someone else to notice but no one seems to? Kari’s my girl…she’s the one who understands that my brain is going to explode if I don’t share it with someone. She’s also a crazy talented writer with a heart that is so moldable and eager for more of God. I would strongly encourage you to check out Kari’s blog for a good laugh and loads of encouragement! 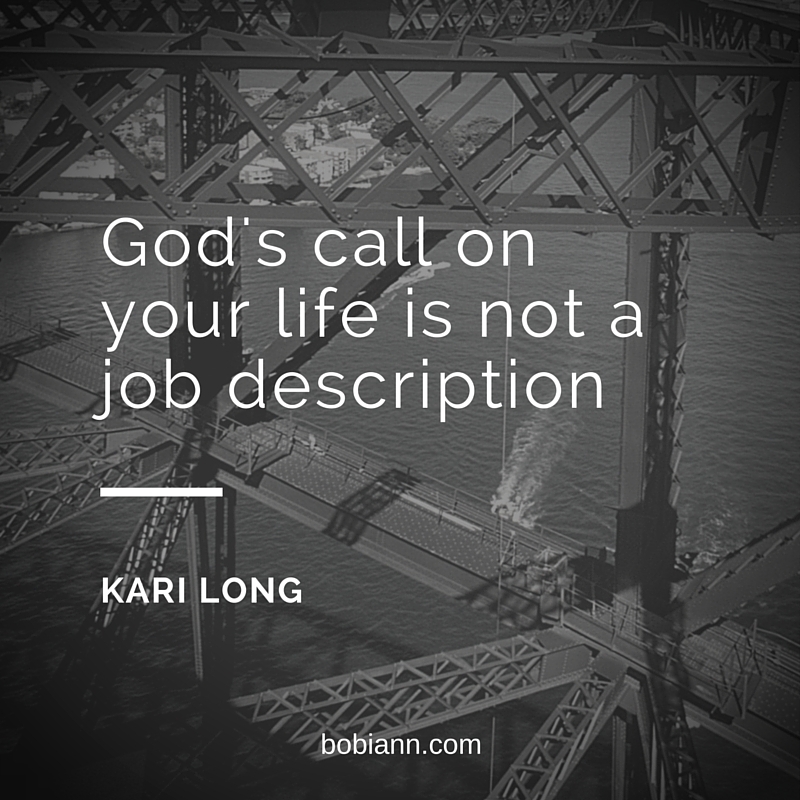 Check out Kari’s BlogUntil then soak in the anointed words from my dear sister, Kari. Writers don’t like clichés. This poses a real dilemma for Christian writers because clichés are what Christians do best. We can take a deep spiritual truth, dilute it, make an acronym out of it, turn it into little more than a buzz word and screen print it on a tee-shirt like nobody’s business. We really have the corner on this market, people. Some fun examples would be “It’s all about that grace, ’bout that grace, no trouble”, #blessed, and the infamous WWJD craze of the 1990’s. You know you had the bracelet. And you know, some of those kids grew up to do the very thing they felt God calling them to at that tender age. But most of us sat there (and maybe possibly rolled our eyes) and thought that we weren’t “called” to anything at all, because we didn’t have that emotional experience. 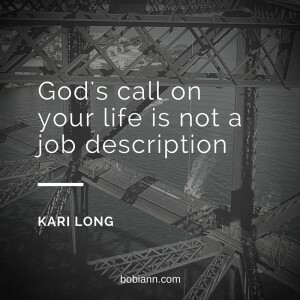 So in my mind, “calling” became some sort of elusive event that only happened to really holy or really talented people. I struggled through my teenage existence and eventually grew up to be an adult cliché, playing piano in church and singing with the worship team. I figured that must be my calling. I was pretty good at it, and it gave me a sense of purpose and identity in the church for a time. Then my life sort of imploded and nobody asked me to sing anymore. I had to start over with just me and God, and figure out who I was in Him without the clichés and the banal platitudes. Just me and Him. And I learned a few things. Rest assured, friends, that your calling is more than a teary walk down an aisle at youth camp. It is more than the job you go to every day, or the job you wish you had. You can’t miss it. You can’t outrun it. Just set out after Him. The calling is simply to follow the Caller. One step at a time. I am so glad you and Kari Campbell Long have found each other. She is one of my favorites, and I agree with you that her writing is real and genuine. Thanks again for your transparency, Kari. You are one hilarious and intelligent woman! 🙂 I just cracked up reading this, mostly because there is so much truth in this post! It’s hard to take some churches seriously because of the plethora of cliches left and right, church/ministry marketing strategies that are no different from commercial marketing strategies, etc. These things are obviously effective and working for mega churches especially. I honestly just have to separate myself from this type of community however. It just doesn’t sit right with me. I love the truth in this that God will accomplish His purposes in our lives, no matter how much we mess up. More than that, He has accounted for the messes and uses them. It takes so much pressure off to know that when I fall short, I have not become forever un-useful to God.